Jeff and I worked hard this weekend! We were busy working on the house, putting stuff up on the wall, assessing the plumbing situation, and putting more stuff away. 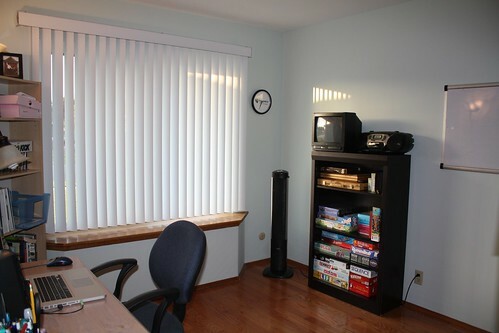 We put up the vertical blinds in the office to replace the broken horizontal blinds that were there previously. Now Butters can look at the window without crashing into them and bending it. Its funny because the night before we put the new blinds up, in the middle of the night i heard him run in the office and crash into them, which he has never done in the middle of the night before, that i can recall. Usually he does this after his “poop energy”. Anyway, it works well. We moved the games bookcase to the office. It was previously in the second bedroom/nursery. Also moved the fan in here from the master bedroom. We never ever used it in this new house, and now i use it everytime i’m working out (duh). 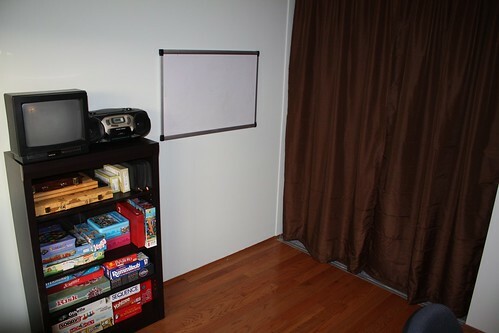 Here is the desk and the bookcase, pretty much unmoved from where it was previously. 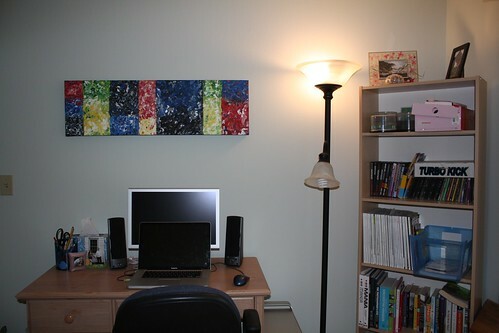 The painting i did a while ago, was previously in the living room above Jeff’s desk. When we removed the asbestos they had to remove the closet doors and their tracks to get everything. So we decided to just chuck the closet doors (they’re just plain, not too nice) and get new ones. Well, i figured i dont really like closet doors anyway (already have them off my master closet) and drapes function better in my opinion. So i went to Target today and bought the tension rod and some brown drapes. Its works great and adds some color to the room. Eventually we might get real closet doors. I’d like to get mirrored ones for the office if that is the case.